We are proud to offer an array of options for printing via a variety of top-notch designers from all over the country. With our collection of albums and in-house design capabilities, along with our expert knowledge of personalized stationery, we are able to create just the right look to express your individual stationery or special event style. Because we know it can be overwhelming with all the options that exist today, we've put together the guide below to offer you a little more insight into the world of custom printing and what makes each of these methods so unique and special. One of the oldest and most elegant processes for printing, engraved stationery is made using a copper plate, called a die. A unique die is created for each custom design, and for each color of the design. The design is etched into a die, creating cavities where ink is deposited. Pressure is applied to the paper so that paper in the design area is pressed up into the cavity. The design area then takes on the ink and the impression of the design. Engraved stationery can be identified by this raised appearance and feel of the design, as well as the underside of the paper, where the design areas have been indented, or bruised. Engraving is a truly timeless and an exquisite choice for invitations, personal stationery, and business stationery. As with engraving, embossing involves using plates, or dies. Paper is pressed between two metal plates, one an exact negative of the other so that the paper is pushed into indentations creating a three-dimensional, raised impression of the design or text. Embossing involves no ink, so the resulting impression maintains the color of the paper, and therefore is often referred to as “blind embossing” because no ink is used to create the finished product. Embossing has a simple, elegant, and timeless look, which is often used for monograms on personal stationery and for emblems and logos on business stationery. Due to its understated appearance, embossing is also a lovely choice for return addressing. Whereas engraved and embossed stationery is characterized by the raised impression of the text or design, letterpress stationery is characterized by the indented impression of the text or design into the paper. The letterpress die presses ink into the impression creating a beautiful, classic effect. This centuries-old technique results in a crisp, debossed impression that is further enhanced by the rich qualities of the paper upon which it is printed. Letterpress printing is most beautiful and noticeable on heavier weight stock, typically made from cotton. Foil printing involves the stamping of foils onto paper. With a precise combination of heat and pressure, foil stamping utilizes a metal die to apply a thin layer of foil to paper and often leaves a slight debossed impression similar to that of letterpress. Foils may be made from metal and may be produced in a variety of colors. Foil printing has a characteristic metallic look, and the printed area has a unique, standout shine. Thermography uses a combination of ink and powder resin which is heated to reproduce a beautiful raised lettering effect on your stationery that you can feel. The end result will have a glossy finish with an embossed raised look. 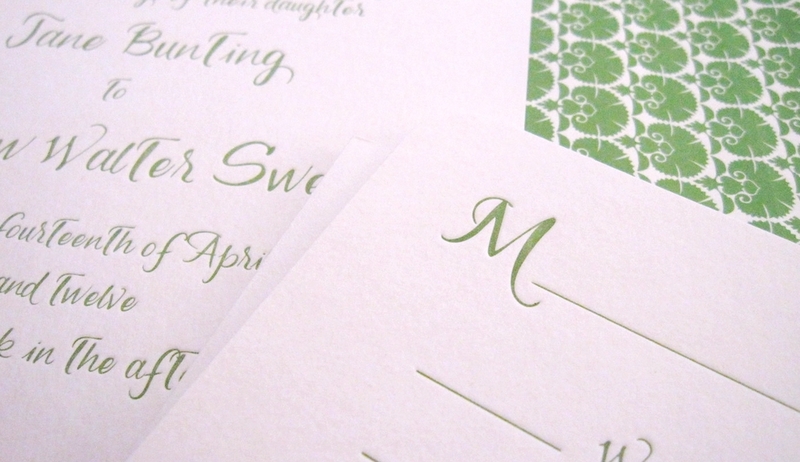 Often, thermography is used as a less expensive alternative to engraving on formal invitations, but it is also an appropriate choice for informal invitations and everyday stationery items. Offset, or flat printing, also called lithography, is a process in which ink is transferred onto paper using a rubber cylinder. As with thermography, flat printing is not quite as labor or time-intensive as engraving, embossing, letterpress or foil. The finished result is a rich, flat, smooth image. Offset printing is considered very versatile because it can be used with several different types of paper, thin or thick. Digital printing is a modern printing process that is also referred to as flat, four-color printing. The digital printing process involves spraying ink onto the paper rather than creating an impression. Quality digital printing results in bold, rich colors, and is therefore an excellent choice for stationery with photographs or full-color images, such as Save-the-Date announcements with a photograph, holiday photo cards, and business materials that call for crisp, full-color printing.